Are you a Musical Voicenerd? Welcome to our brand new Musical Theatre Voicenerd quiz. 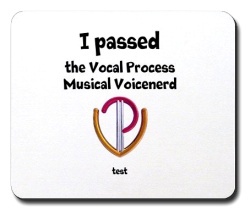 No prizes for this one, but if you get all the answers right (and we’ll provide them on a separate webpage so you can’t cheat) then why not reward yourself with a brand new "I passed the Vocal Process Musical Voicenerd test" mousemat from the Vocal Process Voicenerd Collection – you’ve earned it!